Messages on the Sidewalk: Sorry. We're Unable to Give You An Education. Sorry. We're Unable to Give You An Education. There is something sacrilegious about closing down a school. It is like denying food to starving children. There has been a lot of talk recently in New York City about closing down low-performing or failing schools. In fact, a few months ago the New York City Department of Education announced plans to close or phase out seventeen schools on account of their failure "to deliver" for the students they serve. What is more is that the students in most of these schools are mostly minorities and the schools themselves are in neighborhoods where the property tax is relatively low, meaning that they will not get the kind of attention and funding that schools in neighborhoods of higher property tax would normally get. Further, the children in these schools are usually from low income families, and many of them are also low-functioning, troubled, and at high risk for getting involved in deviant behavior. The City would like to put the blame for the low performance of these schools on teachers, but that is disingenuous and is nothing more than an unwillingness on the part of the city to face up to its responsibility of making sure that every child has the quality of education that is his or her right. So instead of closing down these schools, every effort must be made to ensure that those schools have the necessary funding, that teachers have ongoing training, that the schools' environment is conducive to learning - in other words that class sizes are appropriate for learning that children are safe. 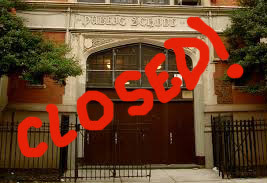 The City's failure to keep these schools functionally viable means that the city has failed our kids.